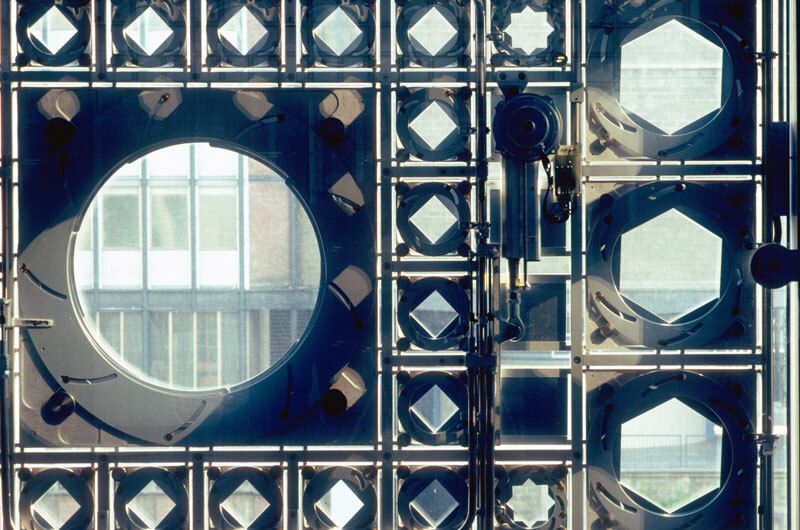 Southern façade is made up of two hundred and forty square metal grids to filter the light. 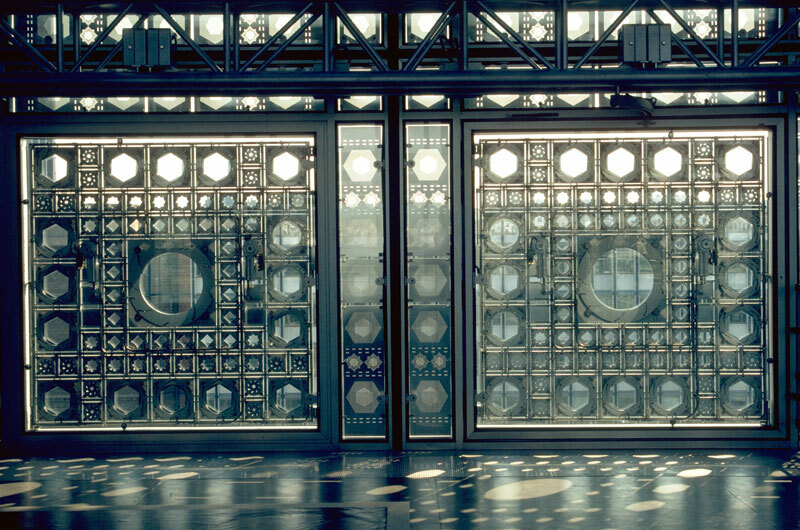 Institut du Monde Arabe, Paris, France. 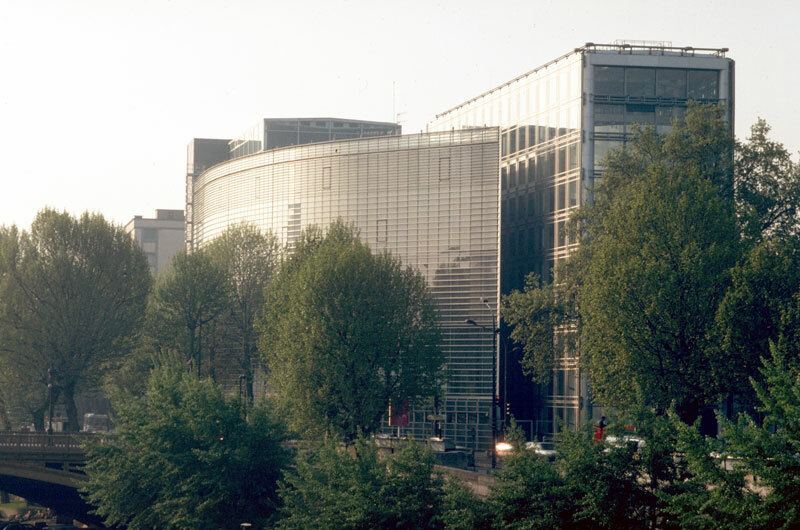 Exterior view of the Insitute from the right bank of the River Seine, Institut du Monde Arabe, Paris, France. Exterior view of the curved form of the north wing and the rectangular form of the south block. 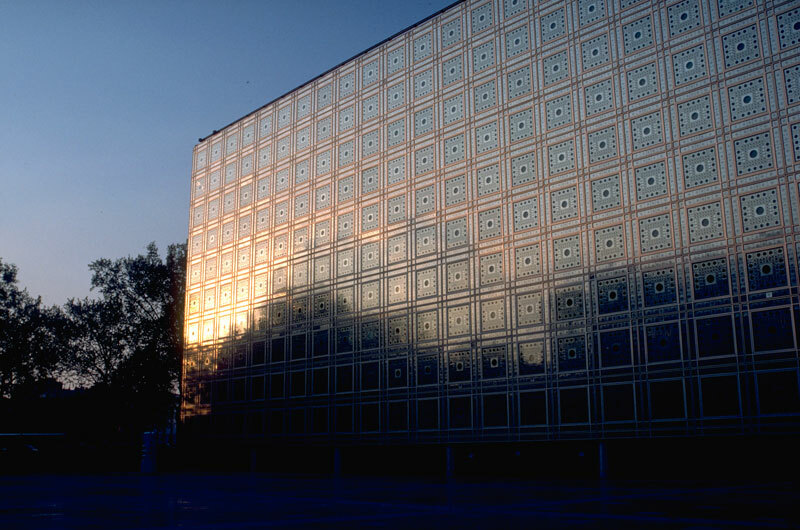 Institut du Monde Arabe, Paris, France. 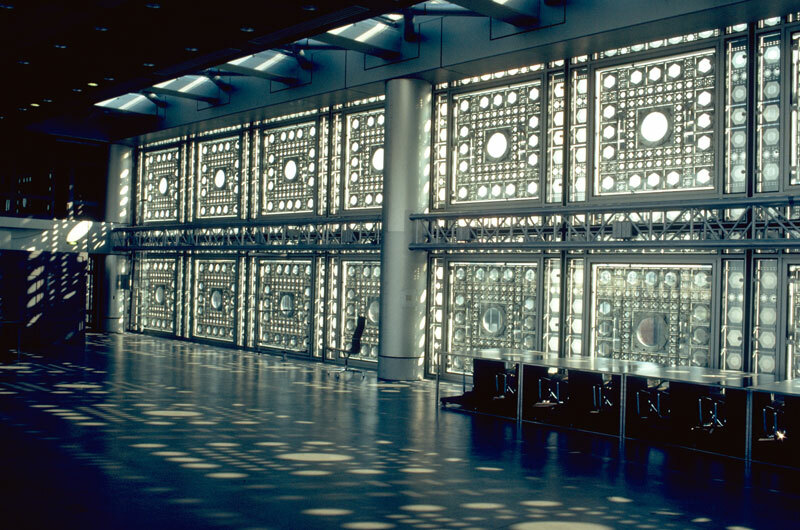 Interior, north wing, Institut du Monde Arabe, Paris, France. Detail, metal photo-sensitive sunscreens. Institut du Monde Arabe, Paris, France. This center of Arab culture occupies a beautiful site on the left bank of the Seine, facing the Ile St-Louis from the riverside edge of the University of Paris.The building consists of a museum, a library, an auditorium, offices and meeting rooms assembled within two wings separated by a courtyard opening out toward the Cathedral of Notre-Dame. The translucent marble façade of the seven-storey northern wing is elegantly curved to follow the sweep of the quay. 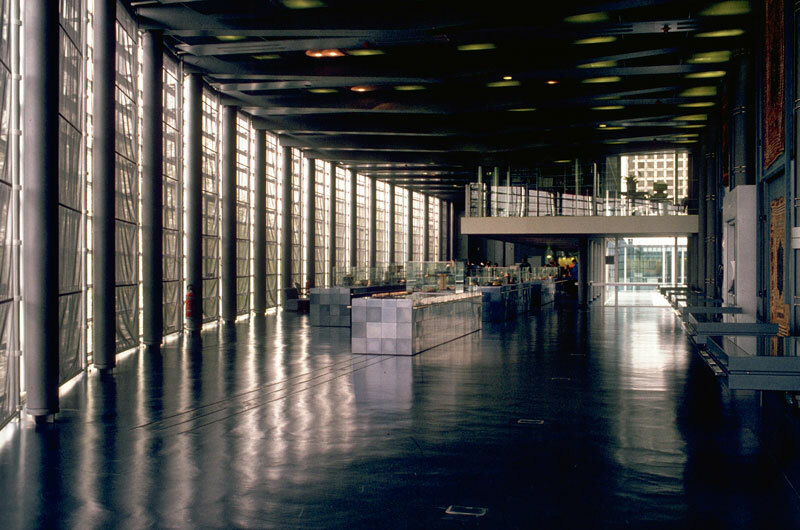 At the west end of this wing is the 100'000 volume library, a spiral tower of books behind a transparent wall of glass offering panoramic views. The principal facade of the eleven-storey southern wing consists of 113 photosensitive panels that operate like a camera's diaphragm opening and closing to control the intensity of light in the interior. 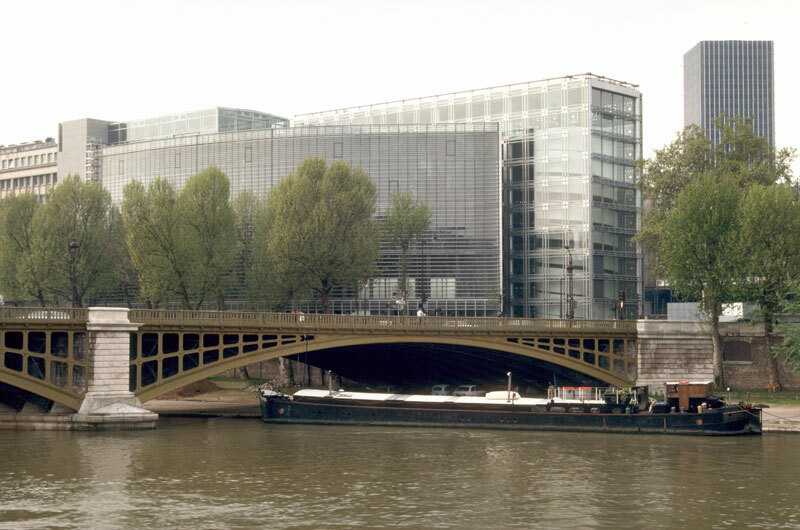 The jury, while acknowledging that the building is not successful in all aspects of its design and at times overly complex to use with ease and comfort," found much to commend in its role as "a successful bridge between French and Arab cultures.